A daring and original YA novel, Leigh Bardugo’s Six of Crows brings a whole new meaning to the brilliance that is fantasy fiction. After receiving an offer one simply can’t refuse, Kaz Brekker assembles a team of misfits to infiltrate a prison notorious for its impenetrable walls. A comical yet dark adventure story full of well-rounded characters, Bardugo’s fantastic novel is a must read for all fantasy lovers. For months, a number of book bloggers have recommended this series to me. Though I was intrigued, I was nervous to start the novel. Not only was I rather busy with ARCs at the time, but I also wasn’t sure how I felt about multiple POVs in a third person narrative … this typically isn’t my cup of tea. To my great delight, I was completely blown away by this novel; all the things I tend to dislike that occurred in this novel didn’t matter anymore! Bardugo’s uncanny ability to draw all types of readers into this action packed heist story is truly remarkable. The last time I read a book with such intensity to finish reading it was the Harry Potter series by J.K. Rowling…which is saying quite a lot. Though I have a few minor woes regarding this novel, I cannot begin to express how surprised I was by the brilliance of Bardugo’s writing. CONTENT & TRIGGER WARNING: This book contains sexual assault (presumed and mentioned in passing), abuse (mental and physical), child abuse (mostly in passing), drug abuse, violence, kidnapping and abduction, death and dying, prejudice and bigotry, and mental health problems. The Grishaverse world is both unique and continuously evolving throughout the story, which I find a great asset to a fantasy novel. The aesthetics of the world, especially in Ketterdam, give off a 17th or 18th Century European vibe; this really worked with the story. The most memorable element is how detailed the novel is regarding the plots connection to worldly events. From past wars to rulers currently in power, Bardugo stealthily slips these facts into the narrative without it feeling out of place and maintaining a connection to the story – there are also connections to her previous works, which many fans will enjoy. Good world building makes a story feel more memorable, for an author can create an abundance of side stories and introduce so many characters without readers losing interest. You care not only for the novel and characters … you just love the world as a whole. THIS made me want to continue reading the other spin offs and side stories of this world! There are little to no words to describe Bardugo’s exceptionally written characters. The novel focuses primarily on six main characters, all with greatly different backstories and character traits. I simply couldn’t get over how DYNAMIC and UNIQUELY DIFFERENT Bardugo’s prime characters are! YOU WANT TO KNOW ABOUT THEM ALL! From Kaz’s intense and dark personality to Jesper’s comical nature, each one felt different from the other … AND YOU LOVE THEM ALL! Seriously, I’ve NEVER loved all the main characters in a novel so much, especially with such a large cast. The multiple third person point of view writing style was beyond impeccable, even for us multi-third person haters. I avoid multiple points of view like the plague, and I’m not really a fan of third person narration either. So for ME to say that this narrative was absolutely marvelous is a true testament to how grand Bardugo’s writing is. Even though it was third person, I felt CONNECTED to each character like I do when I read first person narrative – as though I was apart of their story. And even though the POV primarily switched between five of the six characters, Bardugo made sure to maintain the likeness of that character in their chapters. When it was Kaz’s chapter, it felt darker. When it was Nina’s, hope started to flutter back again. Seriously…HOW IS SHE ABLE TO WRITE LIKE THIS!? To all of you who are lovers of the written language, look no further. Bardugo has somewhat of a poetic writing style, both descriptive yet to the point. It never felt over-the-top but the world and it’s inhabitants felt as though they were painted before my eyes as I read. There are also SO many memorable quotes and “key phrases” in this novel: “Scheming face” … “Definitely”. Not only does this make the novel more memorable, but it’s like an inside joke to have with all other readers of the series. The moral ambiguity is intense in this novel, more than I was expecting. Time and time again, books depict good and evil on two different sides of a coin … which is REALLY frustrating since that’s not how the real world works. Bardugo is FEARLESS in this department, with her most lovable characters demonstrating sinister and utterly dark thoughts and actions. No character is untouched by darkness in this book, even the most gentle of souls such as Wylan and Nina. But there’s also hope for the lost souls, such as Kaz and Matthias and Inej. Just brilliant! Even though Six of Crows is an adventure filled story, the beginning was simply too slow. It was REALLY hard for me to get into the book. Strangely enough, the first chapter actually starts off really dark and creepy – it really drew me in. Then for some reason, it was slow yet not slow at the exact same time. Even though we get the chance to read from five different POVs, the lack of Wylan’s thoughts was frustrating. Not only was I just eager to see how different his POV would be from the other five characters, but it felt weird that Bardugo would choose to opt out of one of them. It didn’t make sense to me plot wise, making the choice to remove his POV rather awkward and unnecessary. Here’s hoping for more Wylan in book two! Though it’s not a requirement to comprehend the story, I highly suggest reading the trilogy prior to reading this duology. Chronologically speaking, Bardugo’s Grisha Trilogy takes place before Six of Crows. Though nothing is really spoiled (from what I can tell), I still felt I would’ve enjoyed the story and world more if I read the trilogy first. Certain elements of the world were a little over my head: the Grisha and the war against them, the nations themselves and the races, and the divide among certain nations are some examples. Bardugo eventually explains all these elements to readers, but I’m one of those people that needs to know early on … hence the use of Google at the beginning. Thank you to all the beautiful humans who recommended Bardugo’s Six of Crows duology to me, for I would’ve never picked this book out on my own. The world-building and dynamic characters are phenomenal, especially with the brilliance that is Bardugo’s writing. A completely and utterly enticing tale of mischievous criminals and grand quests, there is absolutely NO REASON why you shouldn’t add this to your reading list. Thank you very much!! It took me quite a bit to collect my thoughts – it’s so hard when you have so much to say!! The hype scared me too … the alternate third person POV did as well ha-ha! 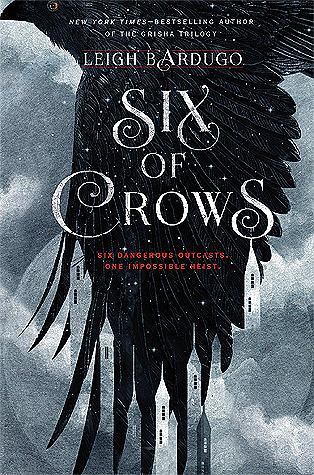 If you liked the Grisha trilogy, I think you’ll enjoy Six of Crows. I haven’t read the trilogy yet, but everyone that’s read it really enjoyed the duology as well. And I think you’ll have a greater appreciation for it since there are some references that make more sense if you read the trilogy first. I definitely recommend you read the duology! I think Bardugo plans to one day make it a trilogy – but it still ends well as a duology. Ooooo….There are a few references to Nikolai so it’ll be nice to read the trilogy to know more about him. Yeah I do think it helps to read the trilogy first, cos it does throw you straight into the Grishaverse. But I agree about how good that world is and how AMAZING the characters are. And the writing is sensational! Brilliant review! I’m definitely reading the trilogy after I finish Crooked Kingdom – I figure I might as well finish the duology now since I’ve already started haha! Thank you very much! I really appreciate that feedback! Awesome! hehe makes sense- and it is an amazing duology!! You’re welcome! Leigh Bardugo’s quickly become one of my favorite YA authors because of how she plays with YA tropes. I can’t wait for King of Scars!